Pallet Wrapz, Inc., is the company behind Pallet Wrapz, a patented (patent pending) product that helps to reduce the use and waste of stretch wrap when wrapping and cutting open pallets. It is a reusable, weather proof, vinyl coated polyester material that is fabricated with velcro straps and metal D-rings. While the company had initially projeceted a 9-month product life, it has found the reusable wraps to last well over a year. 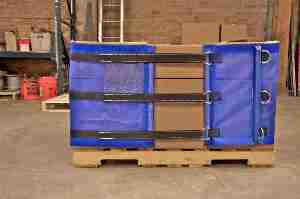 Pallet Wrapz are designed primarily for 48″ x 40″ pallets and come in three sizes, 2′ high, 4′ high and 6′ high. Pallet Wrapz can create a custom size to fit any size or shaped pallet. According to Pallet Wrapz, its product can provide a quicker application and removal than stretch wrap and at least a 45% – 50% savings. For more information, contact Pallet Wrapz, Inc., at 800 733-0813, or visit www.palletwrapz.com.